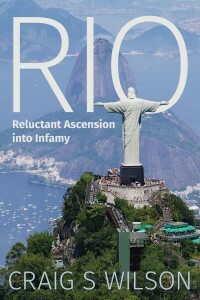 RIO—Reluctant Ascension into Infamy is a young adult saga of Lucas “Pantera” Rocha, a sixteen year old from a Rio de Janeiro slum, who recently lost his mother and brother and is now sole provider for his twin six-year old sisters, Fernanda and Inez. His desperation compels him to steal the wallet of Daniel Silva Burke, an American who has just arrived for the February 2008 Carnival festival. Twenty years ago, an American couple adopted Daniel after a tragic flood orphaned him. He has returned in search of his legacy. After his life crashes into Lucas, he finds much more than he expected including the love of his life. Meanwhile, Lucas nearly loses his sister Fernanda, who becomes seriously injured. He curses himself for leaving his sisters alone, and vows to become a drug runner at night while they sleep. Lucas convinces his elderly neighbor, Matheus, to introduce him to Antonio “Dez” Mendez, the charismatic drug lord of Amigos dos Amigos. But his plan backfires when Dez uses him as a pawn for his vicious turf battles with crosstown rival gang, Comando Vermelho. Lucas survives a bloody ambush and ultimately wins the respect of Dez. As he slowly ascends into power, Lucas quickly learns that even good people do bad things for the greater good. RIO is a Godfather study of Rio gangs. The perfect backdrop is Rio de Janeiro: From atop the Corcovado, Christ the Redeemer statue delivers mercy to an ostensibly idyllic city below. In reality, the favela drug lords are in constant battle among themselves and against a corrupt police force that is cleaning house for the awarded 2014 World Cup and 2016 Olympic bid.